Daily Illuminator: Visit Scenic Hyboria! February 13, 2012: Visit Scenic Hyboria! Have you been hoping to learn more about exciting Hyboria, home of the world's most famous barbarian? Have you wanted to learn about its geography, history, and religion? Have you dared to catch a glimpse of its exotic wildlife, or encounter its enigmatic magic? Then GURPS Classic: Conan is for you! Newly released to e23, this supplement is your one-stop guide to the Hyborian Age, including how to run a campaign, generate adventurers, and more. 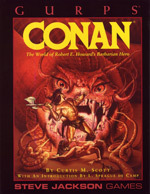 It features GURPS stats for Conan, Bêlit, Thoth-Amon, and others from the Conan saga. It also includes a comprehensive chronological bibliography, for those times when you'd prefer to read rather than roam the realms. With GURPS Classic: Conan, the world of Conan can now be your world!